권오균, 허준수,(2013).저소득 독거노인의 자살생각 인과모형에 관한 연구 .정신보건과 사회사업,41(4),65-93. 본 연구는 저소득 독거노인의 자살생각 관련 변인들 간 인과모형을 규명하기 위하여 건강상태, 사회적 지지, 스트레스, 자아존중감, 우울감 및 절망감 등을 활용하였다. 특히, 매개변수인 자아존중감, 우울감, 절망감의 간접효과를 분석하였다. 자살생각에 대한 개별변수들의 직접효과 중에서는 스트레스, 우울감, 절망감이 자살생각에 직접효과로 작용하는 것으로 나타났다. 즉, 스트레스가 높을수록, 우울감이 높을수록, 절망감이 높을수록, 자살생각이 높았다. 자살생각에 대한 간접효과 중에서는 우울감, 절망감이 자살생각에 간접효과로 작용하는 것으로 나타났다. 즉, 우울감은 건강상태, 사회적 지지, 스트레스가 자살생각에 미치는 영향을 유의미하게 매개하였고, 절망감은 건강상태, 스트레스가 자살생각에 미치는 영향을 유의미하게 매개하였다. 본 연구의 주요결과를 바탕으로 저소득 독거노인 자살생각에 대한 개입에 대해서 제언해 보면 다음과 같다. 첫째, 저소득 독거노인의 자살생각을 감소시키기 위해서는 저소득 독거노인의 우울감과 절망감의 위험군에 대한 조기발견과 개입이 필요하다. 둘째, 저소득 독거노인의 자살생각을 감소시키기 위해 사별이나 죽음에 대한 외상 후 스트레스 관리 및 훈련, 위기개입 등이 필요하다. 셋째, 저소득 동거노인의 우울감과 절망감을 감소시키기 위해 건강관리 프로그램이 필요하고, 사회적 지원 네트워크를 강화해야 한다. 넷째, 저소득 독거노인의 자살 예방을 위해 지역사회 중심의 대처자원을 구축하고 강화하는 전략이 필요하다. 다섯째, 저소득 독거노인의 자살예방을 위한 노인 전용 상담기관 및 전담기구를 마련해야 한다. 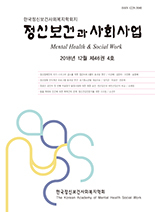 This study of low-income elderly people living alone to explain the suicide health status, social support, stress, self-esteem, depression and hopelessness, etc. were used. Suicide of a direct effect of the individual variables of stress, depression, despair at the thought of suicide was found to act as a direct effect. Among the indirect effect on suicide depression, despair at the thought of suicide was found to act as an indirect effect. The major findings of this study on the basis of interventions for low-income seniors living alone thinking about suicide to suggest is as follows. First, the low-income elderly people living alone in order to reduce the suicide of low-income elderly people living alone at risk of depression and despair for the early detection and intervention is required. Second, the low-income elderly people living alone to reduce the suicide bereavement, death, management and training for the post-traumatic stress, such as crisis intervention is required. Third, low-income seniors living in order to reduce the depression and despair need health care programs, and social support network should drop. Fourth, the low-income elderly people living alone in the community center for suicide prevention resources to build and strengthen the coping strategies that are needed. Fifth, low-income seniors living alone for the prevention of suicide in the elderly-only counseling agencies and task force should be prepared.